How would you convert a 20 year risk free rate into a monthly rate? The Fama-French and Momentum Portfolios and Factors in the UK are available for bona fide academic research only from the University of Exeter Xfi Centre for Finance and Investment. Do you know where I can find daily Fama-French factors for UK as Exeter’s webpage only provides monthly and yearly data? Thank you! I am afraid not. Exeter’s webpage is the only source of Fama-French factors for the UK that I know about. Sir, thank you for your response! How should I convert the uk tbill tender 3M(UKTBTND) downloaded monthly from datastream to be comparable with the monthly Fama-French factors from Exeter’s webpage? Hi, Really hope that somebody can help me out, I have struggled with this for a week now.. I have constructed quarterly portfolios, and want to test them up against Fama-French 3 factor model.. 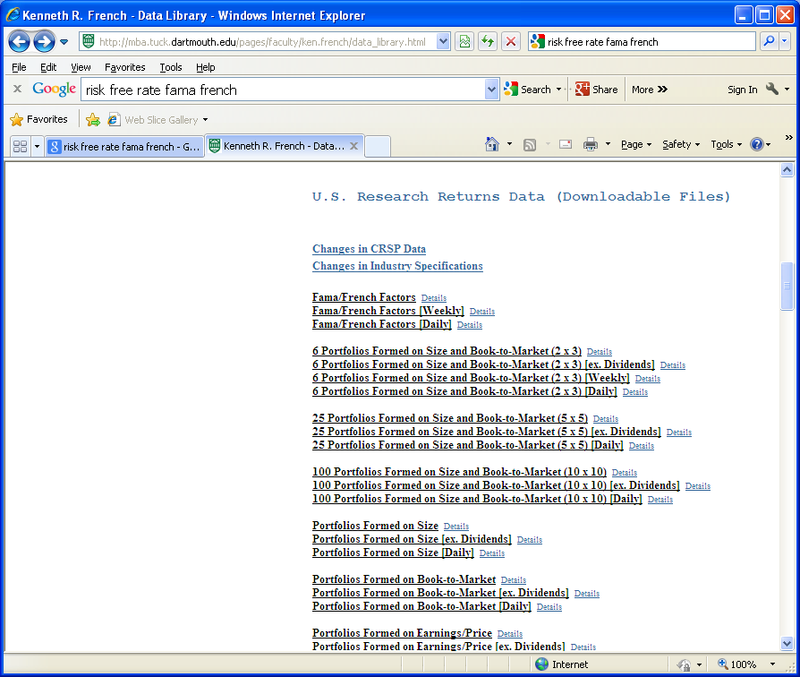 I have downloaded daily observations on Fama-French 3 factor model from French´s homepage. I Have also downloaded 3 month us treasury bills (monthly compounded) from Bloomberg. How can I adjust the RF on the Fama-French model and 3 m t-bills so that they are comparable?